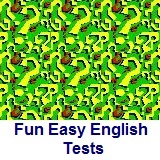 ﻿ Fun Easy English - new american english grammar topic phrasal verb. In this lesson you will learn the definition of a phrasal verb, study examples of phrasal verbs, and take a test. Phrasal verbs are verbs that contain a verb and a particle which together form the unit of meaning. Study the examples below. For the test, fill in the blanks with the correct phrasal verb. The office manager tried to put together the new table. The inventor spent the weekend trying to think up a new invention. 1. He has to ________ the balloons for the party. 2. She wanted to ________ the clothes before buying them. 3. The teacher decided to ________ the exam until next week. 4. The student had to ________ all night studying. 5. Quit acting like a child. You need to ________. 6. She needs to ________ her clothes at the dry cleaners. 7. The couple decided to ________ their problems instead of ending the relationship. 8. You should ________ the old product before opening a new one. 9. If it rains, we have to ________ the game. 10. He already spent one hour trying to ________ the math problem. Are You Crazy About English? An audio lesson to help with your understanding of phrasal verbs. The English is spoken at 75% of normal speed. Click here to visit the lesson page with the written script for this audio program.